If you love watching Independence Day fireworks displays, this is a roundup of the best places to enjoy them in California. San Francisco sets off twin 4th of July fireworks displays: They're launched from Aquatic Pier just below Ghirardelli Square and from a barge near Pier 39. Two of the best places to watch them are from parking garages: on the top floor of the Anchorage shopping center and the Pier 39 garage. To see fireworks all around the Bay, try Treasure Island. Or go up into the Marin Headlands north of the Golden Gate Bridge for a bird's eye view. For both of the locations, you need to get there early. These prime spots fill up hours in advance. You can also see the fireworks while on a dinner cruise with Hornblower Cruises. During the day, head to the East Bay for one of the country's biggest Independence Day parades. In fact, Alameda Fourth of July parade is so big that locals joke that half the 80,000 residents turn out to watch the other half marching past. In case you don't know about San Francisco summer weather, don't plan on watching the fireworks wearing a skimpy summer outfit. July 4th in San Francisco can be foggy and cold. In fact, people sometimes wear as many as four layers to keep warm while watching the fireworks. The big celebration at Lake Tahoe is Lights on the Lake., the largest synchronized fireworks display in the western United States. The fireworks are launched from barges just off the South Shore at the town of Stateline, Nevada. Incline Village also has an Independence celebration, the Red, White, and Tahoe Blue Festival includes a parade, fireworks, and duck races, featuring an adorable bunch of rubber duckies floating down the stream toward the lake. In a rare year with lots of late snow, you might have a hard time deciding whether to pack the water skis or the snow skis for Tahoe on the Fourth, with skiing still going on at some of the area's bigger, higher-elevated resorts like Squaw Valley. San Francisco's twin fireworks shows and Tahoe's pyrotechnics often overshadow other northern California July 4th celebrations, but don't let them distract you. Try some of these fun activities for a change of pace. Napa County Fair: The annual county fair often ends with a fireworks show. Get this year's schedule. 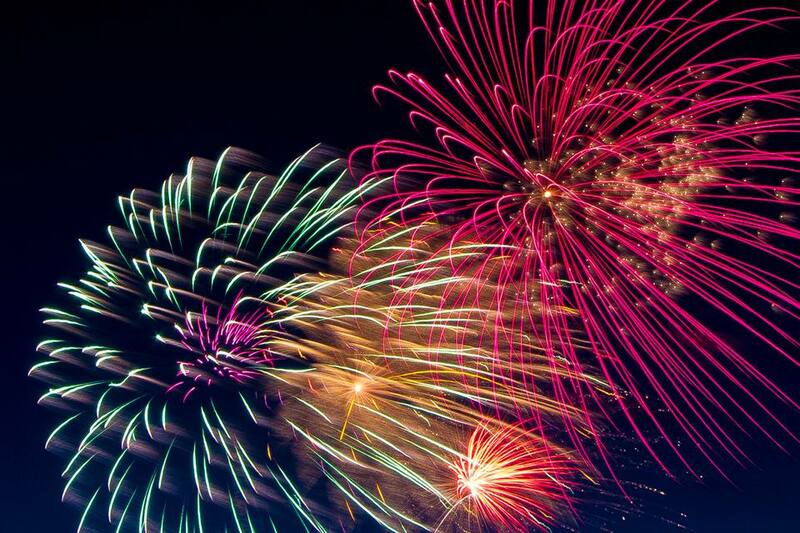 Sacramento: The state capitol's July 4th Pyro Fireworks Celebration is held at CalExpo, the state fairgrounds. USA Today says Sacramento's Raley Field is one of the best places to watch minor league baseball in the country, and what could be more American than that? Check the Sacramento Rivercats' schedule. Six Flags Discovery Kingdom: In Vallejo, you can ride yourself silly and see a fireworks show, all in the same place. Check here for more details, hours, and schedule. Lake Oroville: A nice fireworks show over the lake in the beautiful Sierra Nevada foothills, lasting about 30 minutes. Details are on their Facebook page. Ski Mammoth: It may not happen very often, but every once in a while, snow lingers so late in the Eastern Sierra that on the 4th of July you can ski at Mammoth Mountain. Old-Fashioned Fourth of July in Gold Country: The Gold Rush town of Columbia puts on a very old-fashioned Fourth of July Celebration, with a parade anyone can march in. After that, there's a concert, street dance, and lots of traditional activities to enjoy. You'll find lots of fun ways to celebrate Independence Day in the LA area. Disneyland: It's like 4th of July every day when the fireworks go off at Disneyland, but on Independence Day, you'd better get there early. The park can get so crowded that they stop letting new visitors in. And find a spot to watch the fireworks extra early, too. Hollywood Bowl: At the Hollywood Bowl, 4th of July concerts feature a headline act and patriotic music performed by the Hollywood Bowl Orchestra. When they start playing The Star Spangled Banner, it's hard for any patriotic American to resist the thrill when the rockets go off at just the right moment - and the fireworks show is so close that you have to crane your neck to see them. Marina del Rey: Los Angeles' big public fireworks display happens at Marina Del Rey, just south of Santa Monica. This guide has all the details. Newport Beach: Southern California's largest fireworks display happens at Newport Dunes Resort in Orange County, and one of the best places to watch them is on a dinner cruise. There's also a fun Old Glory Boat Parade in Newport during the day. Cinespia at Hollywood Forever: The summer film series at the Hollywood Forever Cemetery includes a movie and a fireworks display to rival some of the best in town, and you can watch it all from the comfort of your picnic blanket. Find out what's playing and get your tickets ahead of time at the Cinespia website. Rose Bowl, Pasadena: Americafest at the Rose Bowl has been going on for more than 80 years. It's an all-day 4th of July celebration, with reasonably priced tickets, a concert and fireworks display. A Grand Party: All four blocks of Grand Park in downtown Los Angeles turn into a 4th of July Block Party, but know this ahead of time: No alcohol is allowed and bags will be searched. Private Showing: Instead of going to a public event, find a vacation rental that has a city view. High-rise buildings downtown are especially good. You can also look for something in the hills with a deck and view, but be sure that the view they show is taken from the exact place you'll be staying. Pick up food and beverages, settle down on the deck, and watch the fireworks going off all over town. San Diego celebrates the 4th of July in a big way, with their Big Bay Fireworks show, launching aerial displays from four barges around the bay. The best places to watch are North San Diego Bay, Shelter Island, and Harbor Island. Or why not watch them on a dinner cruise with Hornblower? Big Bear: California's fifth-largest 4th of July fireworks display happens at Big Bear Lake in the mountains above Los Angeles. Check the schedule at the Big Bear website. Unusual Fourth of July Parade: In the town of Avalon on Catalina Island, golf carts outnumber cars so what else could they hold but a golf cart parade? It's followed by a barbecue and music at the Casino, with fireworks viewing from the balcony. You'll find details about it on the Catalina Chamber website. Have a Presidential Fourth: The Ronald Reagan Library in Simi Valley offers a fun look into American politics and the Presidency - and they've got a real Air Force One airplane on display. On Independence Day, they offer patriotic concerts and family entertainment, with free admission to the outdoor activities. If you want to go camping in a California state park for Independence Day, reservations open January 2. Find out how to reserve your spot and get tips on what to do if they're full. If you're taking a trip for the holiday, you might want to do something on July 2nd or 3rd... or even the 5th. Explore more things to do in California in July here.